Investing in the TOP 10 junior or main market stocks is a no brainer. These stocks are valued well below the average of the market PE ratio and at an even larger discount to the valuation based on 2016 earnings, around 20 times. Investors would be well advised to leave emotions out of investment decision making and get and stick to facts. 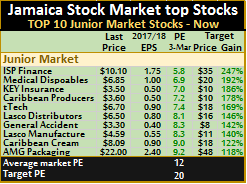 Investors who bought Jamaica Stock Exchange at $14 now and now seeing it trading at $7 after just a few weeks, can attest to that. Even investors at current prices may find that the price could fall further when the company post its first quarter results. Those results will not enjoy the big income generated in the first quarter of 2016, estimated at $110 million, from the transfer of the shares in Desnoes and Geddes and should result in a big fall in profit for the 2017 quarter. 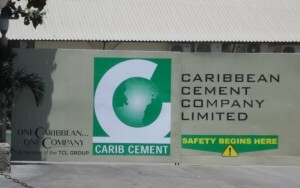 Investors also pushed Jamaica Producers to dizzying heights, only to see a marked decline in the share price after, from $22 down to the $16 level and may have cause to worry with 2016 earnings from continuing operations not supporting the high valuation placed on it. The market appears to be consolidating with a number of 2016 results not sending strong buy signals currently. Prices of Access Finance, Dolphin Cove and Jetcon Corporation rose during the past week and exited the IC Insider.com’s Top 10 junior market list. These stocks are still within striking distance for the top tier listing but market activity in the coming week could change all of that. Jetcon rose 22 percent during the week and 522 percent since it was listed in March last year. Entering the top list are Lasco Distributors, the expectations are that the company will benefit from the claim for damages, with much of the funds retained for income generation purposes,Lasco Manufacturing and AMG Packaging as the prices of all three slipped during the week. AMG Packaging approved 5 for 1 stock split, is to be effected on March 10, after much delay. 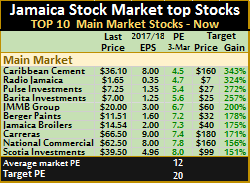 In the main market of teh Jamaica Stock Exchange, Cable & Wireless reported larger losses than expected in the nine months to December, as a result IC Insider.com revised the forecast for 2017 down to just 10 cents on the assumption of continued strong growth in revenues. The stock fell out of the top list as a result of the earnings down grade. The move by Cable & Wireless let Jamaica Broilers into the list with the stock prices falling to $14.54 on Friday.